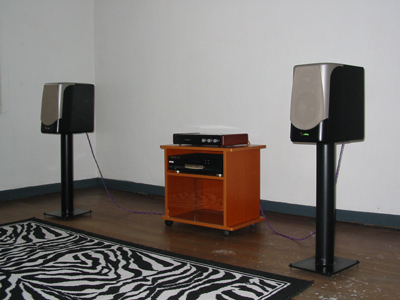 When I started my journey back to this audio hobby, I acquired modest equipment consisting of a CD player, integrated solid state amplifier, and a pair of speakers. I have an unused room which I converted to an audio room. Speakers: Infinity Kappa 200 @ 89dB/1w/1m sensitivity. The Fase Evoluzione PF45 integrated amplifier is a pre-owned unit I got from a local audio store owned by Rene Rivo, a well known tube equipment builder in Manila. At that time, i thought I was not ready for any tube equipment and I don't have budget for such. The Harman Kardon HD-750 and Infinity Kappa were purchased from Architectural Audio when I met really good guys Nico and Epoy. I chose the HD-750 because it has HDCD encoding and the price is cheap compared to other CD players I compared it with that includes Rotel, Arcam, Musical Fidelity. I chose the Infinity Kappa 200 bookshelf after auditioning about a dozen speakers that include Dynaudio Audience 52, Sonus Faber Concertino, Acoustic Energy, Energy, B&W, etc. I wanted a speaker that is not boring to listen to as my music preferences ranges from Classical to Heavy Metal. The combination of Fase + Infinity Kappa proved to be a good one for me as the warm character of the Fase mated well with the lively character of the Kappa.